Participants at the Doctors Workshop on the Evaluation of Permanent Impairment at Holiday Inn yesterday. Photo: PAULINI RATULAILAI. Acting Permanent Secretary for Employment Osea Cawaru officially opened Phase II Doctor’s Workshop on Evaluation of Permanent Impairment at Holiday Inn Suva on Thursday. Occupational medicine specialist from Sydney, Australia, Dr Dwight Dowda conducted training during the two-day workshop, which ended yesterday. “This training will boost the number of competent assessors in addition to the 129 medical assessors who have been trained by Dr Dowda. 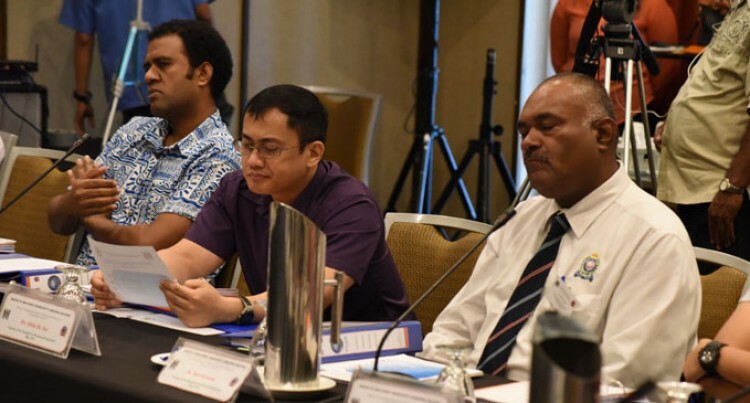 These hands-on training will assist you to adapt to the guidelines that are set out in the Fiji Impairment Guide Manual,” Mr Cawaru said. “The ministry aims to build a decent and productive work for all, ensuring social justice, good faith employment relations, safe and productive-driven workplaces,” he said. Mr Cawaru said the ministry was about to complete the six components of the labour reforms – which includes the OHS reform, ER reform, productivity reform, employment creation reform, wages reform and workers compensation reform. Dr Dowda said the two-day workshop would help doctors distinguish between impairment and disability and determine whether impairment is work-related or not. Dr Dowda has since 2007 provided the ministry with training in the evaluation of permanent impairment.